Chen,F.H.,Chen,J.H.,Holmes,J.A.,Boomer,I.,Austin,P.,Gates,J.B.,Wang,N.L.,Brooks,S.J. and J.W. Zhang,2010,Moisture changes over the last millennium in the Arid Central Asia: a review,synthesis and comparison with monsoon region. Quaternary Science Review,29（7-8）： 1055-1068. Zhang,D.J.,Chen,F.H.*,Bettinger,R. L.,Barton,L.,Ji,D.X.,Morgan,C.,Wang,H.,Cheng,X.Z.,Dong,G.H.,Guilderson,T.P. and Zhao,H.,2010,Archaeological records of Dadiwan in the past 60 ka and the origin of millet agriculture. Chinese Science Bulletin,55⒃： 1636-1642. Fan YX,Chen FH,Wei GX,Madsen DB,Oviatt CG,Zhao H,Chun X,Yang LP,Fan TL,Li GQ,2010.Potential water sources for Late Quaternary Megalake Jilantai-Hetao,China,inferred from mollusk shell Sr/Sr ratios. Journal of Paleolimnology,43:577-587. Wang,J.S.,Chen,F.H.,Jin， L.Y.,Bai， H.Z.,2010. Characteristics of the dry/wet trend over arid central Asia over the past 100 years. Climate Research,41⑴：51-59. Chen,F.H.,Holmes,J.,Wünnemann,B. and Yu,Z.C.,2009,Holocene climate variability in arid Asia: Nature and mechanisms. Quaternary International,194:1–5. Chen,F.H.,Wang,J.S.,Jin,L.Y.,Zhang,Q.,Li,J. and Chen,J.H.,2009,Rapid warming in mid-latitude central Asia for the past 100 years. Frontier of Earth Science in China,3⑴： 42–50. Xie,Y.W.,F.H.,Chen* and J.G. Qi,2009,Past desertification processes of Minqin Oasis in arid China. International Journal of Sustainable Development & World Ecology,16⑷： 260–269. Zhao,Y.*,Yu,Z.C.,Chen,F.H. 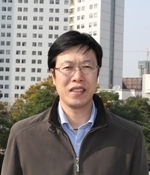 *,Zhang,J.W.,Yang,B.,2009,Vegetation response to Holocene climate change in monsoon-influenced region of China. Earth-Science Reviews,97: 242-256. Jin,L.,Peng,Y.,Chen,F.,and Ganopolski,A. 2009,Modeling sensitivity study of the possible impact of snow and glaciers developing over Tibetan Plateau on Holocene African-Asian monsoon climate. Climate of the Past,5,457–469,2009. Barton,L.,Newsome,S.D.,Chen,F.H.,Wang,H.,Guilderson,T.P. and R.L. Bettinger,2009,Agricultural origins and the isotopic identity of domestication in northern China. PNAS,106⒁： 5523–5528. Chen,F.H.Yu,Z.C.,Yang,M.L.,Ito,E.,Wang,S.M.,Madsen,D.B.,Huang,X.Z.,Zhao,Y.,Sato,T.,Birks,H.J.B.,Boomer,I.,Chen,J.H.,An,C.B.,Wünnemann,B.,2008,Holocene moisture evolution in arid central Asia and its out-of-phase relationship with Asian monsoon history. Quaternary Science Reviews,27: 351–364. Chen,F.H.,Fan,Y.X.,Chun,X.,Madsen,D.B.,Oviatt,C.G.,Zhao,H.,Yang,L.P.,Sun,Y.,2008,Preliminary Research on Paleolake Jilantai-Hetao in Late Quaternary. Chinese Science Bulletin,53⑾：1725-1739. Zhang,P.Z.,Cheng,H.,Edwards,R.L.,Chen,F.H.,Wang,Y.C.,Yang,X.L.,Liu,J.,Tan,M.,Wang,X.F.,Liu,J.H.,An.,C.L.,Dai,Z.B.,Zhou,J. Zhang,D.Z.,Jia,J.H.,Jin,L.Y.,and K.R. Johnson,2008,A Test of Climate,Sun,and Culture Relationships from an 1810-Year Chinese Cave Record. Science 322,940-942. An,C.-B.,Chen,F.-H.,Loukas,B.,2008,Holocene Environmental Changes in Mongolia: A Review. Global and Planetary Change,63:283–289. Yang,L.P.,Chen,F.H.*,Chun,X.,Fan,Y.X.,Sun,Y.,Madsen,D.B. and Zhang,X.Q.,2008,The Jilantai Salt Lake shorelines in Northwestern arid China revealed by remote sensing images. Journal of Arid Environments,72:861-866. Gou,X.H.,Chen,F.H.,Yang,M.X.,Gordon,J.,Fang,K.Y.,Tian,Q.H. and & Zhang,Y.,2008,Asymmetric variability between maximum and minimum temperatures in Northeastern Tibetan Plateau: Evidence from tree rings. Science in China,51⑴：41-55. Chen,F.H.,Cheng,B.,Zhao,H.,Fan,Y.X.,Madsen,D.B. and Jin,M.,2007,Post-glacial Climate Variability and Drought Events in the Monsoon Transition Zone of Western China between Monsoon and Westerly dominant regions since the last deglacial. In D.B. Madsen,F.H. Chen and X. Gao (Eds),Late Quaternary Climate Change and Human Adaptation in Arid China. Developments in Quaternary Science,2007,Elsevier,Amsterdam,11-24. Jin,L.Y.,Chen,F.H.*,Claussen,M. and Ganopolski,A.,2007,Response of East Asian climate to Dansgaard/Oeschger and Heinrich events in a coupled model of intermediate complexity. Journal of Geophysical Research,112,D06117,doi: 10.1029/2006JD007316. Li,J.B.,Chen,F.H.*,Cook,E.R.,Gou,X.H. and Zhang,Y.X.,2007,Using tree-rings and the Palmer drought severity index to reconstruct the drought history in Helan mountain,north central China. International Journal of Climatology,27: 903–909. Gou,X.H.,Chen,F.H.,Jacoby,G.,Cook,E.,Yang,M.X.,Li,J.B.,2007,Streamflow variations of the Yellow River over past 593 years in western China reconstructed from tree rings. Water Resource Research,VOL.43,WO6434,doi:10.1029/2006WR 005705. Zhou,A.F.,Chen,F.H. *,Qiang,M.R.,Yang,M.L.,Zhang,J.W.,2007,The discovery of annually laminated sediments (varves) from shallow Sugan Lake in inland arid China and their paleoclimatic significance. Science in China Series D,50⑻： 1218-1224.